Are women generally more religious than men? Does it matter? Please, examine the figures below in detail. I will provide general statements to guide your understanding. 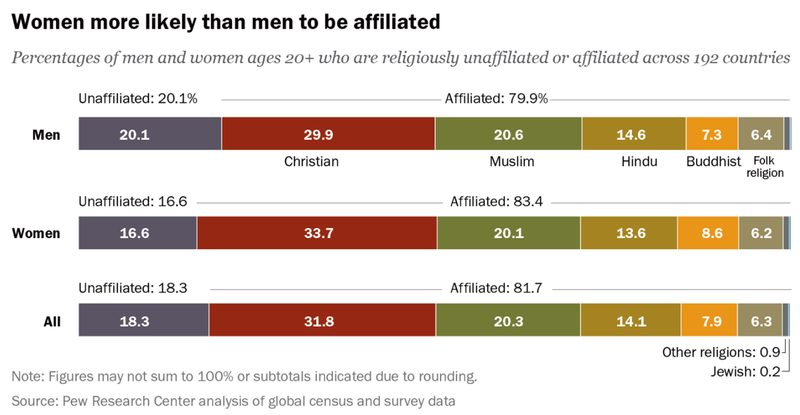 The first image summarizes how women worldwide are more likely to be religiously affiliated (83.4%) than men (79.9%), and this is the case across religions (Christian, Muslim, Hindu, Buddhist, folk religions, other religions and Jewish). In consequence, the religiously-unaffiliated women worldwide tend to be fewer (16.6%) than men (20.1%). With this information in mind, the histograms below become fairly easy to grasp. 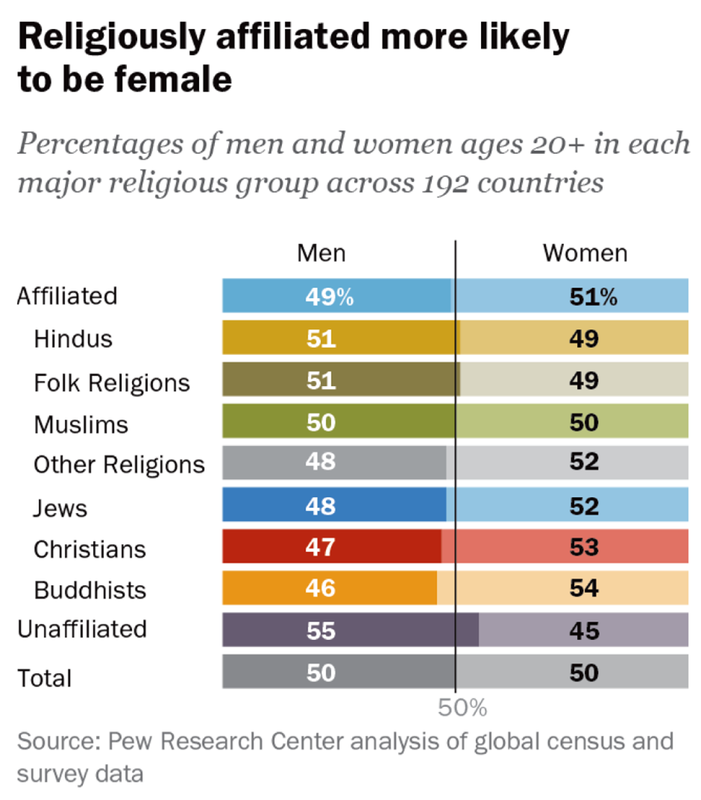 They summarize the percentages of religiously affiliated men and women (ages 20+) in each of the major religious groups. 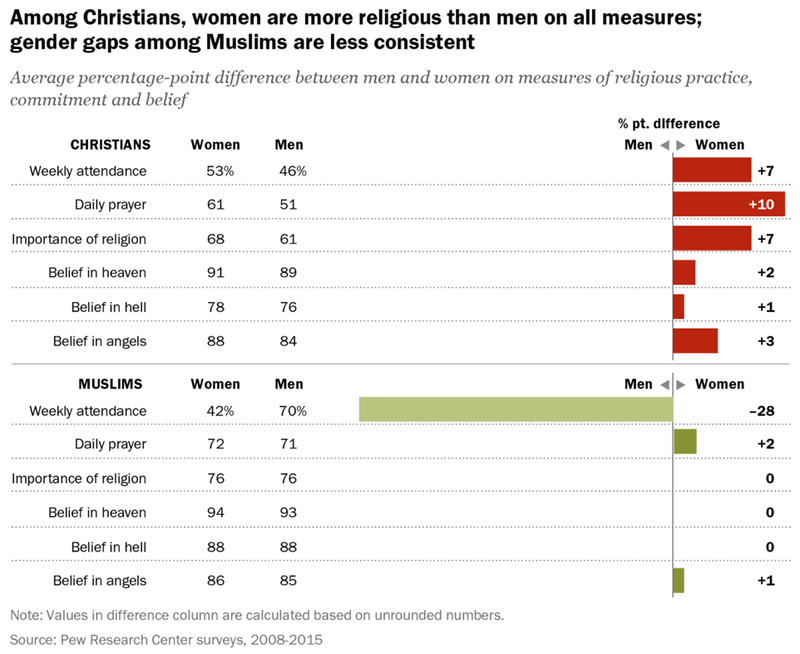 Note how, in the majority of cases, women are more religious than men. 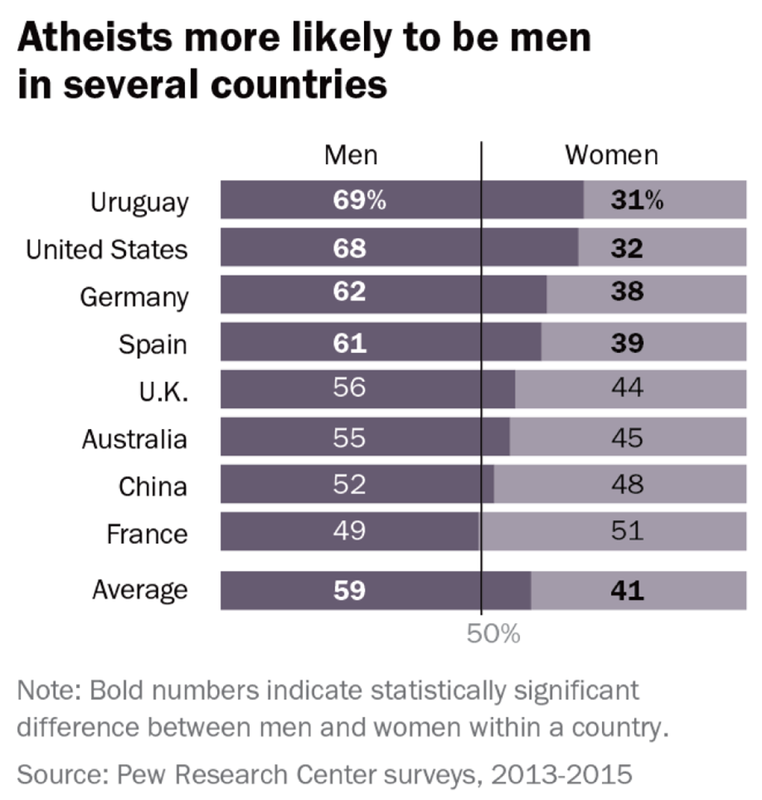 And note also how among the unaffiliated people, only 45% of women, in contrast to 55% of men, consider themselves non-believers, agnostics, or non-practitioners of any organized religion. The next image shows how, among Christians, women tend to be more religious than men on specific categories, including: weekly attendance to religious services, daily prayer, considering religion to be important in their lives, believing in heaven or hell, and believing in angels. These W-M differences are not statistically evident among Muslims (except for attendance to religious services, which is heavily men oriented). What about the atheists? Well, they tend to be mostly men across the sampled countries (i.e. Uruguay, US, Germany, Spain, UK, Australia, China and France), except for China and France where the difference M-W is minimal. What is the situation in the United States? The religiosity gender gap in the US (the most religious nation among the most developed) is quite accentuated: 47% of men versus 64% of women pray daily; 47% of men versus 60% of women consider religion to be important in their lives; and 32% of men versus 40% of women attend religious services weekly. In these three categories, the US surpasses all other developed nations, including Canada, UK, Germany, Australia and France. Does employment (or being part of the labor force) have any effect on the gender gap of religious practices? The answer is yes. Women OUT OF the labor force (not working) are generally more religions than men. In fact, women out of the labor force double, or almost double, men in praying daily, attending religious services weekly, and considering religion to be important in their lives. The “pray daily” category is particularly informative. For example, in predominantly Christian nations, having more women in the labor force is associated with a reduction in the religiosity gender gap. In other words, women who work not only pray less than women who do not work, but also their difference in praying in comparison to men is less when women have a paying job. 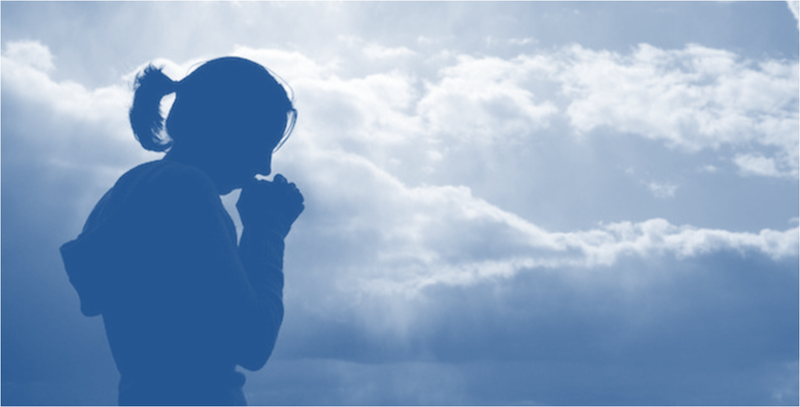 The association described above, however, is not evident among predominantly NON-Christian nations; in them, having more women working is not associated with the size of the gender gap in daily prayer. Can the reader tell (or hypothesize) why? Hint, look at the dot distribution in the figure below, and also the percent point range above and below 0% (the y axis on the left); then, examine the dot distribution on the x axis (bottom). (1) Women who participate in the labor force show lower levels of religious commitment than women who do not work outside the home for pay. (2) When these two groups of women are compared with men (most of whom are in the labor force), the gender gaps [continue to] differ. (3) The gap between women who are in the labor force and men tends to be smaller than the gap between women who are not in the labor force and men. (4) This pattern holds even after accounting for education level, age and marital status. 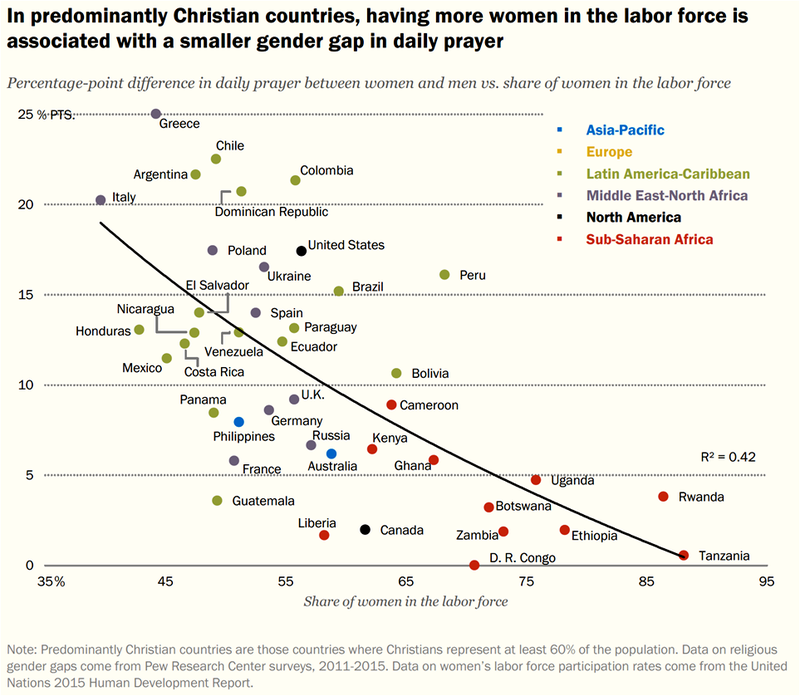 (5) Across predominantly Christian countries, the overall gender gaps in daily prayer and importance of religion are smaller in countries where more women are in the labor force. In essence, the Pew Research Center report is highlighting that “being part of the labor force,” in other words, “just having a job,” makes women less religious, and, therefore, the gender gap in religiosity shrinks (although it does continue to persist). But the Pew Research Center chooses to be politically correct and says nothing about the oppressive role of religion itself on women (more than on men) that contributes to the overall gender inequality in most societies (beyond religion). It does not address either the type of individual and socio-economic independence gained by women when joining the labor force in Christian nations (mostly in the West) versus elsewhere. But I want to make sure that the readers keep in mind that we ought to celebrate secularism worldwide, and pursue the vanishing of religion all together. We are not aiming at shrinking the religiosity gap between men and women who believe (alone or together) in a non-existing deity. That is not the point, not even the starting-point in this dialog. The secular perspective is about bringing reason and science to the debate over “belief,” and to free societies from the sequels of belief: disruption, distortion, delay or stop (3Ds + S) in the acceptance of any evidence, and particularly of scientific evidence. — EvoLiteracy News.